For both new and old homeowners, embarking on a remodeling project is a great way to claim a space as your own. Designing and building rooms can show your own tastes and styles, and can be tailored specifically to your preferences. However, homeowners should consider remodeling not only for themselves, but for the environment. By adapting the project with sustainability in mind, homeowners can not only reduce their ecological footprint, but also save themselves a few bucks in the process. When renovating a bathroom, a major portion of the budget goes into purchasing appliances, bathtubs, vanities, sinks and so on. Luckily, for the sustainable homeowner, there are a number of options built with sustainability in mind. There are a wide range of appliances designed to save water and energy, ranging from eco-friendly bathroom vanities to low flow shower heads. While certain appliances may have a high initial cost, they can help the homeowner save money in the long run. A variety of components within the bathroom can be rebuilt with sustainable and reclaimed materials, allowing homeowners to reduce their ecological footprint without sacrificing look or feel. For example, bathroom cabinets can be made with bamboo or wheatboard, a material that is made from a combination of wheat straw and binder. But if you prefer the look of wood-like materials, reclaimed lumber is a viable option that allows homeowners to have a positive effect on the environment. 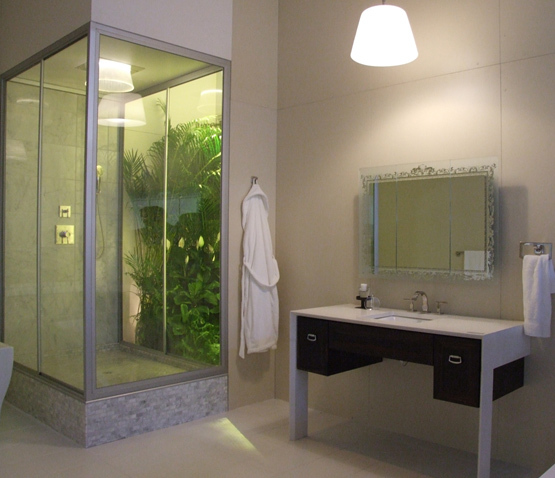 Vanities and furniture are not the only components in the bathroom that can be made with sustainable materials. Replacing flooring materials with sustainable alternatives are another way to save costs as well as the environment. For example, bamboo flooring is made from a fast growing, renewable material that is water-resistant and durable. If your bathroom possesses tile flooring, then choosing tiles made from clay or glass made from recycled materials is another viable option. Water is a finite resource and should be conserved as much as possible. Luckily, there are a wide variety of options that can help you save money in the long term through lower water usage. For example, low-flow faucets, shower heads, and toilets are items that use significantly less water than their full-flow counterparts. In the long run, these appliances can help you save gallons of water. Instead of buying new appliances and furniture, consider purchasing used ones instead. Oftentimes, retailers sell refurbished items, which are used goods which have been restored and reworked to working order. Bathtubs are a common item that are refurbished and made to look new. Additional items that can be purchased include appliances, fixtures, and discount bathroom vanities. Not only will you save time and money, but you’re also taking part in recycling appliances and other precious materials. Sara Fletcher is a writer for Premiere Vanities, an online shop with unique bathroom vanities. One day, she hopes to renovate and build her own dream bathroom.